As I’ve stated before there are some characters in the GIJoe mythos that stood out in both the Marvel Comic series as well as in the Sunbow cartoon series. 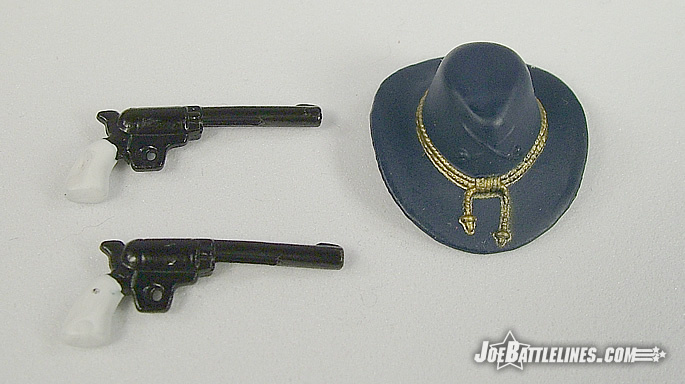 Whether he was piloting the C-130 that flew Snake Eyes to the Silent Castle or trying to save his family’s ranch down in Texas, Wild Bill was a character that made a distinct impression on Joe fans of all ages. 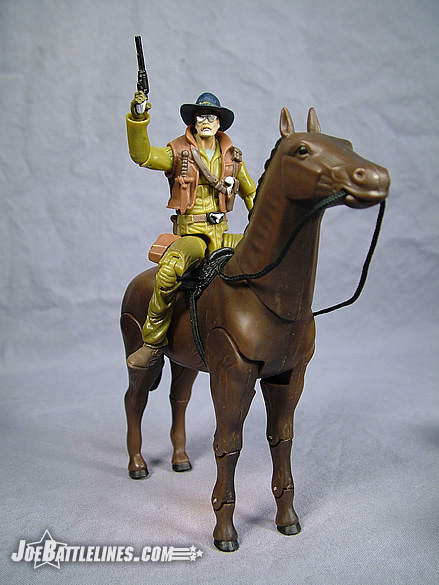 Hasbro answered the myriad cries for William Hardy’s inclusion in the 25 th Anniversary line by adding the Texan Air Cav pilot to the third wave of 2008. 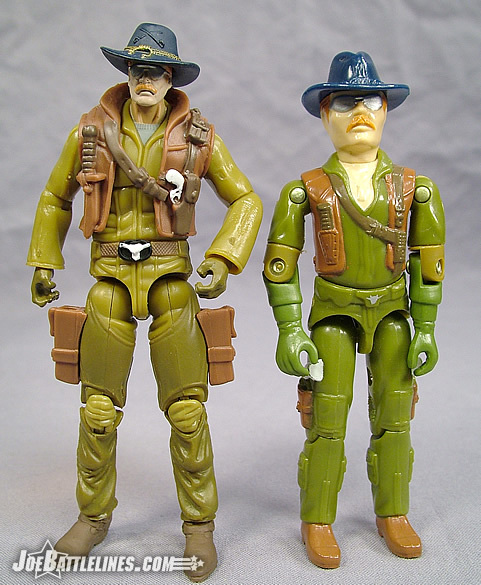 Sharing the same body as the other previously-released GIJoe pilot in this “no-ring” construction line, can Wild Bill live up the anticipation of so many fans? To collectors of the 25th Anniversary line, Wild Bill’s flight uniform should be almost instantly recognizable. 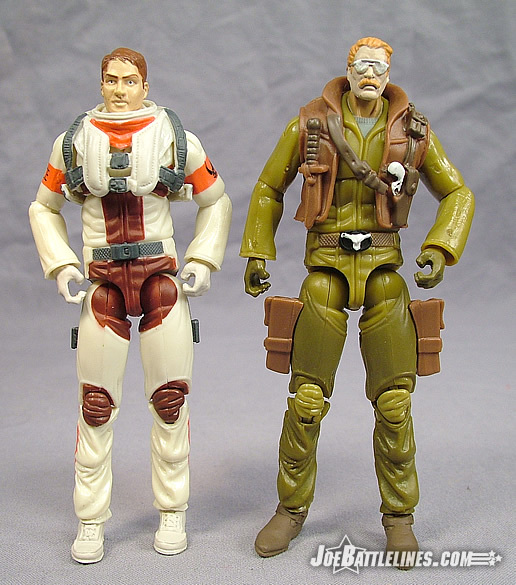 Previously released as Ace in Comic Pack #115, the familiar white flight suit is molded in olive drab to better emulate the original 1983 incarnation of William S. Hardy. The body is unchanged with the exception of two holsters added to the outer seams of the legs, a “longhorn” belt buckle attached to the belt, and a large brown vest added to the torso. At first glance these additions work well to differentiate the figure from Ace; after all how much variation can one expect in a flight suit? The brown vest contains some truly nice sculpting details such as an attached knife and sheath and holstered pistol that replicate the design of the original Wild Bill figure quite nicely. The vest is cut such that it does not interfere with the movement of the figure’s arms and the raised collar is set far enough away from the figure’s head as not to be a problem. Overall, this figure body works well as an update to the Joe team’s premiere helicopter pilot with the exception of one point that I’ll return to later. Do you have any thoughts on the use of the Ace body to produce Wild Bill, Justin? I would hazard a guess that perhaps it worked the other way around. 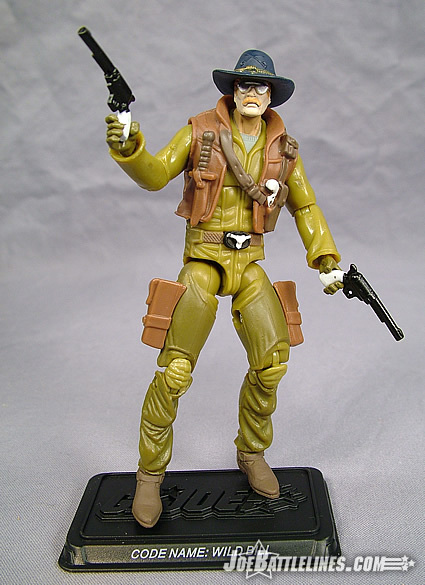 Even though Ace hit shelf first, Wild Bill was originally slated for release in 2008 Wave 2, and just by looking at the figure, I’m inclined to think that Wild Bill was the basis behind the figure design, and they then used it to get Ace in one of the Comic Packs. 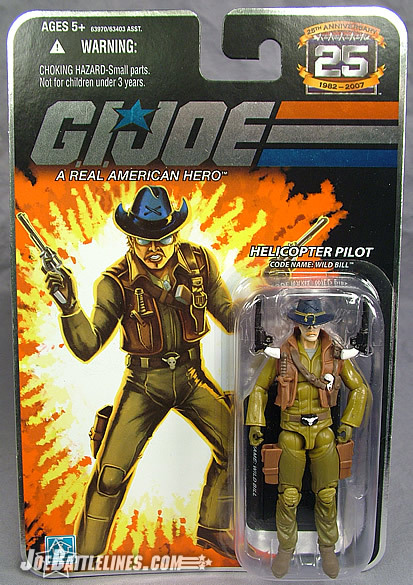 Regardless of the “chicken or egg” argument, though, I think these parts work remarkably well for the Joe helicopter pilot…a lot better than they do for Ace. I’m not sure exactly why the parts just seem to “fit” better…they just do. 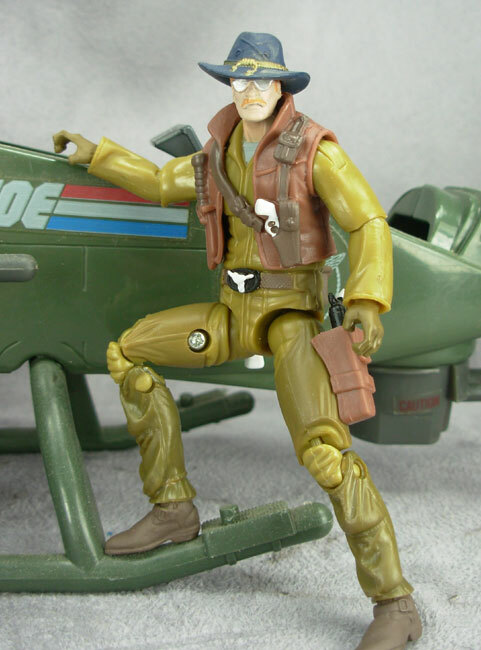 It’s not like any iteration of Wild Bill has ever worn a typical flight suit “stirrup” look, but for some reason Wild Bill just looks better with these parts than Ace did. And yeah, a flight suit is a flight suit, and I don’t see a major problem with both Ace and Wild Bill sharing this “flight suit” look. Who knows, we may see it for Slipstream as well when the Conquest eventually hits later this year. If the body works well as an update of a classic figure then the head sculpt should really help this figure knock one out of the park, right? Unfortunately, the reality is something altogether different. Wild Bill’s head sculpt isn’t that bad—it’s just completely undersized in the way the original figure’s head sculpt was over-sized. 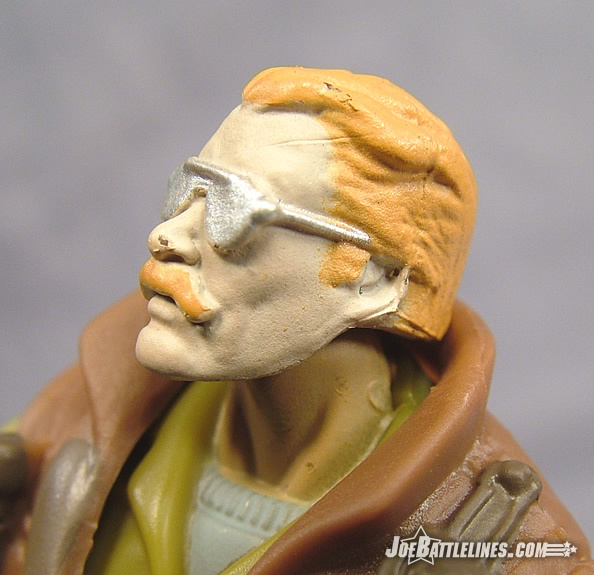 The basic sculpt is fairly generic—a bushy moustache, silver shades, and slicked back red hair all adorn this square-jawed head. It’s not a bad likeness of the character and one that is ultimately more familiar that either the Spy Troops or Valor vs. Venom attempts at the character. However, Wild Bill must have flown helicopters in the south Pacific at one point in his career and run afoul of a voodoo witch doctor. This medicine man seemingly had his revenge on Bill by shrinking his head down—rendering it the smallest head in the 25th Anniversary collection thus far. Normally this wouldn’t be such an issue except that this diminutive noggin sits atop one of the tallest bodies in the entire line and this torso was just bulked up even further by the addition of the brown vest. The result is a figure that is completely and utterly pin-headed even with his removable hat on. 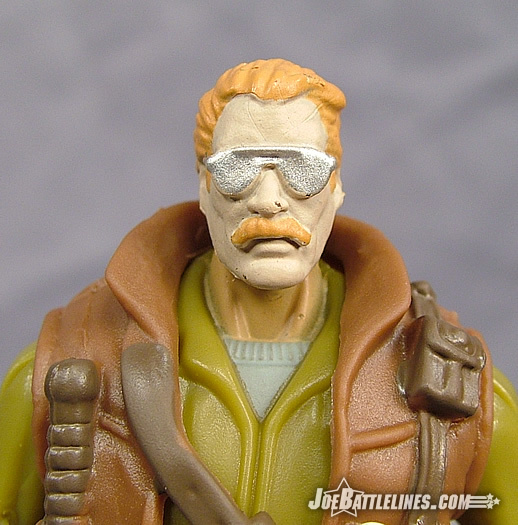 However, the “fun” doesn’t stop there—Wild Bill is one of those characters whose head is molded in a different color plastic than the final form requires. His features have been slathered with a generous coating of flesh-colored paint that gives the figure a pale complexion which is several shades lighter than the shade of flesh tone used to paint the figure’s neck. In other words, Wild Bill has a “farmer tan” on his neck and a head that looks like it hasn’t seen sunlight since 1982. The result is a too-tall pin-head with horrible paint matching on the skin tones. Sorry Hasbro but I’ve seen customizers put out “lazy boy customs” that look more polished than this. Justin might feel that I’m being too harsh on this figure but once again I expect far better than this from the design team in Pawtucket. I’m far from an expert on the toy production process, but issues like this are usually generated from the factory side. I have a very hard time thinking that any professional sculptor or design team (especially those that work for the premier toy manufacturer in the world) would consciously design a head that small in proportion. Generally what you’ll find is that when the figure came back from Asia, for whatever reason the actual production process had an adverse affect on the size of his head. I may not have any idea what I’m talking about, but I have a sneaking suspicion that the end product of Wild Bill’s head size took Hasbro US by as much surprise as it’s taken us. That being said, there are definitely proportion issues with the tooling on this figure, and hopefully we don’t see it used a whole lot. The Joe design team seems to fight a consistent and never-ending battle with “real human proportion” and I thought that fight was over with the Anniversary line…it certainly seemed to be. But at least here, proportion issues are the exception, not the rule. The paint matching issue I’m not sure on. There are color guides on these inputs from what I’ve seen and they use very specific color codes, and I’m sure they matched up on the conception pieces…what happened from there is anyone’s guess, but the end result is a figure that looks a little bit sketchy from the neck up. But really it’s not a huge deal to me. Yeah, his head is too small, but I don’t think it looks awful, the figure itself looks great. Paint matching is off, but the head sculpt is fantastic, the vest is great, I really like the holsters, and the overall look of the figure is just plain great. I realize a great many fans were looking forward to the 25th Anniversary update of Wild Bill and I also realize that I pretty much tore the figure in half in my review. 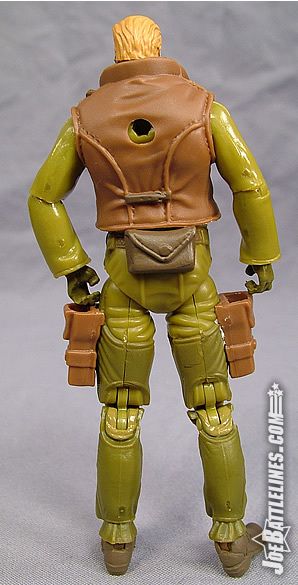 The GIJoe design team has a real problem producing figures with consistent proportions with this “no-ring” line of figures. As the waves went on, I expected the “pin-headed” figures of Roadblock and Destro to be anomalies but instead figures like Breaker and now Wild Bill have made their way into store shelves, proving that when it comes to the proportions of the basic human body some people working in Pawtucket need to take a refresher course. Figures that feature removable head gear should not have smaller heads that figures that don’t. I’ve not observed this problem with the brand-new Indiana Jones line nor has this issue plagued the Star Wars line in recent years. Yet for some reason the GIJoe keeps taking two steps backwards for every step forward that is made in terms of correcting design issues with this new style construction. With 25+ years of experience producing 3.75” scale figures under their belt, one has to wonder just where things have gone wrong. This figure is an utter disappointment in my eyes and one that shouldn’t have made it to final production with bad proportions and poorly matched paint applications. Maybe Justin has something more positive to say but I’m completely and utterly disappointed in this figure. You’re my bro, Fred, but I gotta respectfully disagree with a chunk of what you’ve said above. Yeah, I have some minor disappointment with the Wild Bill figure, but saying that Hasbro has taken 2 steps back and only 1 step forward is a gross misrepresentation of the progress that has been made with these Anniversary figures. I mean, it’s not even close, in my mind. Look at the 5-Pack Duke, Baroness, Roadblock, or Gung Ho, and then look at Battle Armor COBRA Commander, Torpedo, Tomax & Xamot, or hell, the upcoming B.A.T., Barbecue, General Hawk, Bazooka, etc… there is a WORLD of difference. A world. It isn’t a close comparison. Saying that Hasbro is further behind than they were when they started just isn’t fair. 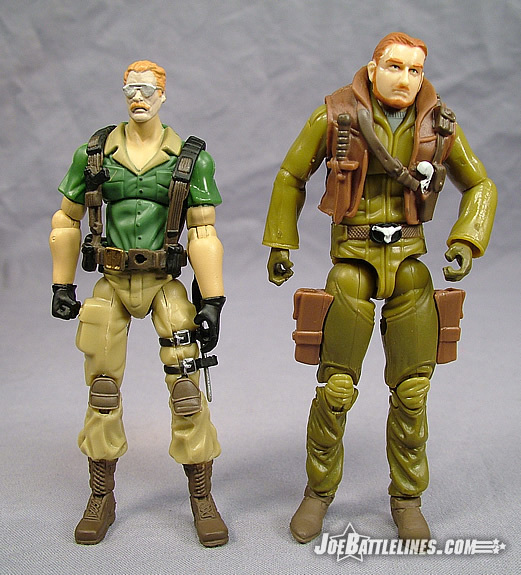 Yes, the Viper is a disappointment in the hands and ankle joints, and Wild Bill has some minor issues with the size of his head, but I think that issue is being blown way out of proportion here. I’ll admit it up front, too…on the majority, this wave of figures is a disappointment. Each figure seems to have little lingering issues that keep it a few steps from as great as they could be (and some figures have major problems). But I don’t think that the line as a whole has taken that many steps back. No offense, Fred, just the way I see it.